Ondina liveaboard diving in Raja Ampat - Book now ! Ondina has been offering a different way to enjoy adventure and exploration diving in the inner seas of Indonesia for many years. Ondina travels year round moving with the seasons to visit the best diving Indonesia has to offer at the right times - Komodo, Raja Ampat, Fak Fak, Sulawesi and Flores, they have an itinerary like no other. 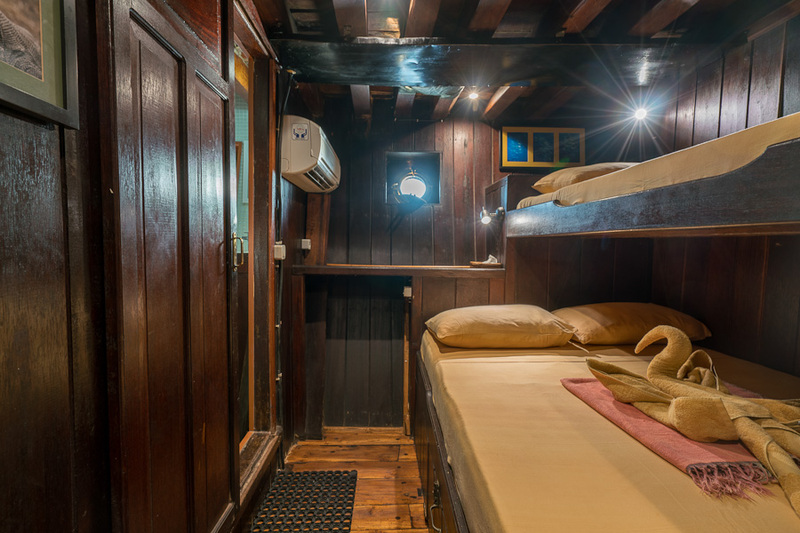 Travelling aboard a classic buginese schooner built entirely of teak and tropical woods you will have the opportunity to explore the most exotic and remote islands of Indonesia seeing places where you could possibly never get to by yourself. 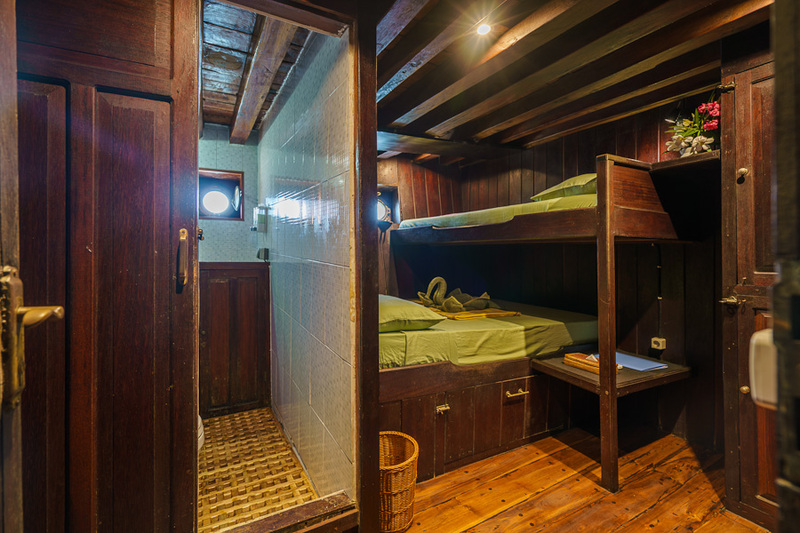 They have tried to create a comfortable accommodation to be your home and base camp as you sail and dive from island to island. All transfers to/from airport or hotel to/from Ondina in the town of embarkation/disembarkation are included and in the routes starting or ending in Bitung, transfers to/from Manado are also included. Average of 3 or 4 dives per day, all in day time or 2 or 3 day dives and 1 night dive unless weather conditions or long sailing distance do not permit it. First and Last Cruise days are excluded due to safety reasons and flight schedules. These dates we will dive accordingly. SMY Ondina will use part of her incomes to encourage and actively collaborate with all local organisations promoting Nature conservancy programs and help for the local communities for improving their living standards. We will actively collaborate with other operators, local governments and nature conservancy organisations in all programs arranged to meet these objectives. Any other way of transportation than S.M.Y. ONDINA, alcoholic drinks, tips gratuities and any other onboard service not specified above like Massages, Equipment rental. Any police or diving permit or touristic tax and harbour fees charged per passenger by any local authority, plus fuel increases. Please count on 150eu/pax for departures in Papua/Maluku and 100eu/pax for departures in Komodo. This amount will be paid once on board when requested by the Cruise Director. We have a limited quantity of SCUBAPRO equipment for rent so we strongly recommend you to inform us about your needs at the moment of the booking. (*) Full Equipment: wet suit, jacket, mask snorkel, fins and regulator. (*) Nitrox users must show valid certification when starting the cruise. (***) 45 minutes. Relaxing and Muscle Stretching. 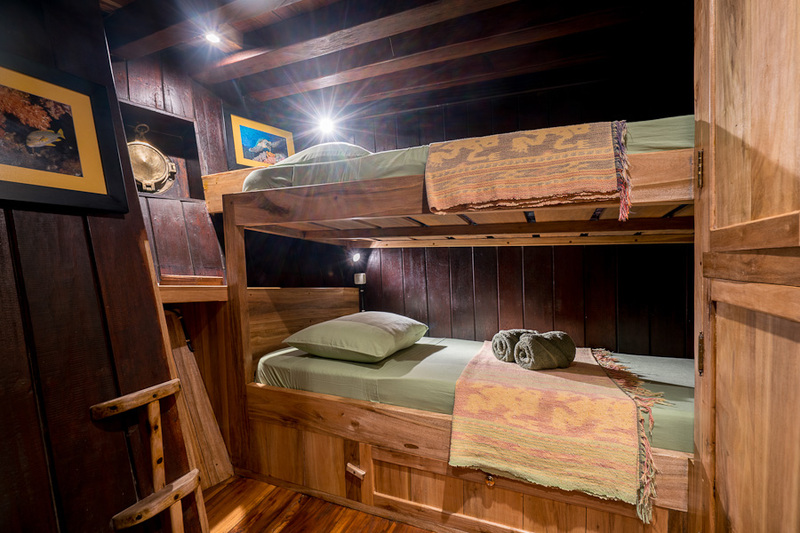 8 cabins are all double occupation and, except two ones in the front both with a double bed, the rest have a double bed and a single bed on top, all with AC and full bathroom. In addition to the traditional fish barbecue on the beach one of the main attractions of this route is the visit to the Komodo Rinca National Park to see the famous Komodo Dragons, the world’s largest variety of carnivorous lizard (Varanus Komodiensis) which can grow up to 3 meters in length. Due to the strong currents of the straits surrounding these islands, and in spite of the fact that the dragons can swim, they have remained isolated on these few remote islands with a distinctly prehistoric look. The visit is a two-three hour walk on one of two islands, Komodo or Rinca, accompanied by a National Park guide, depending on how lucky we are we hopefully will see, apart from the dragons, Timor deer, wild boars, water buffalos, parrots and fowls. Locally made wooden dragon carvings of different sizes and pearls from nearby farms can be bought from the local villagers on the island as souvenirs. During the cruise we will disembark on deserted islands and secluded bays where we can see the flying foxes fly at dusk and also visit some fishing villages during our sail through this incredible and unique place on earth. During the cruise we will also disembark on deserted beaches and visit some fishing villages that we may while sailing in this incredible area. Optional and out of the cruise programm we can arrange an excursion to the Kelimutu National Park in the island of Flores, one of the most visited natural wonders of Indonesia. After a very early drive you arrive early in the morning to the top of the volcano, to be at the summit with the sun rise, the best moment of the day to enjoy the magnificent view of the three different colour lakes, black, red and green. This excursion is not only one of the greatest tourist attractions of the region, but also a very important area of myth and legend. This excursion can be arranged before or after the crusie but always starting from Maumere. Ask for prices depending on how many you are. 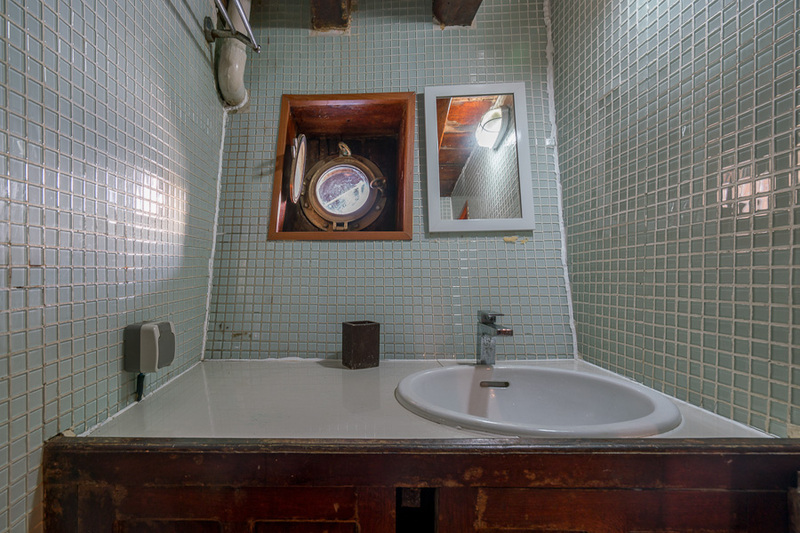 6 Triple and 2 Double cabins all with ensuite freshwater shower, hand basin, toilet and Air Con. What shall I take with me to a SMY ONDINA Cruise? SMY Ondina sails an average of 200-300 miles in every charter (except for the Exploratory ones where we sail a longer distance) to take you to the best diving places, this forces us to sail from 2 to 4 nights every cruise.